Dukane, your source for both high-end and affordable audio-visual equipment, carries document cameras and visualizers for every purpose and every budget. From plug-and-play USB cameras to versatile, full featured visualizers, Dukane document cameras offer outstanding clarity and innovative design. With this extremely versatile line of document cameras, you’ll be able to capture images and project them with ease, allowing everyone to see the presented information. 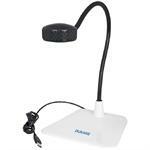 So, make the smart choice and purchase a Dukane document camera for your conference room or classroom. Dukane document cameras are intuitive and easy for anyone to use. Known for reliability, Dukane audio-visual equipment includes industry leading warranties and our document cameras are no exception. Browse our wide selection of document cameras and Contact Us to request a quote for any of these products today. Additionally, you can click Dealer Locator above to request a quote from your local dealer. We are confident that you’re going to be completely satisfied with document cameras from Dukane.